Railways are an environmentally friendly means of transport well suited to modern society. However, noise and vibration are key obstacles to further development of the railway networks for high-speed intercity traffic, for freight and for suburban metros and light-rail. All too often noise problems are dealt with inefficiently due to lack of understanding of the problem. This book brings together coverage of the theory of railway noise and vibration with practical applications of noise control technology at source to solve noise and vibration problems from railways. Each source of noise and vibration is described in a systematic way: rolling noise, curve squeal, bridge noise, aerodynamic noise, ground vibration and ground-borne noise, and vehicle interior noise. 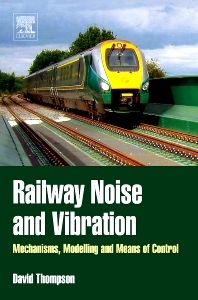 Railway Noise and Vibration is a hard-working reference and will be invaluable to all who have to deal with noise and vibration from railways, whether working in the industry or in consultancy or academic research. David Thompson is Professor of Railway Noise and Vibration at the Institute of Sound and Vibration Research, University of Southampton. He has worked in the field of railway noise since 1980, with British Rail Research in Derby, UK, and TNO Institute of Applied Physics in the Netherlands before moving to Southampton in 1996. He was responsible for developing the TWINS software for predicting rolling noise. The author is Professor of Railway Noise and Vibration at the Institute of Sound and Vibration Research, University of Southampton. He has worked in the field of railway noise since 1980, with British Rail Research in Derby, UK, TNO Institute of Applied Physics in the Netherlands before moving to Southampton in 1996. He was responsible for developing the TWINS software for predicting rolling noise.